1. What is a Fraisier? 2. What does the cooking terminology “Balloutine” means? This was the Top Chef quick fire challenge this Saturday night, and the same dish I had for my 40th. A ballotine is a protein that has been boned, stuffed and rolled and is then poached or braised. 3. What is the difference between a Sorbet and a Granita? 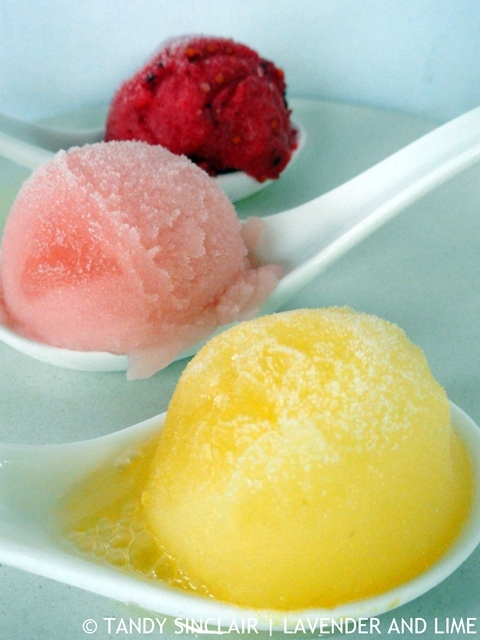 A Sorbet is made from sweetened water and a purée of fruit to which you can add alcohol. A citrus or savoury sorbet is often served as a palate cleanser. A granita, which is similar to a sorbet in ingredients has a coarser texture. 4. What toxin in potatoes causes it to turn green when exposed to sunlight? Something that happens to mine quite often! Solanine? 5. What is the meaning of the term “tartness”, when describing a taste? 6. What is a Biscuit Joconde Imprime/Entremet? 7. Fennel is native to which countries? 8. What is a Kulfi? 9. Which one of these four is not a stone fruit? Peach, Pomegranate, Mango or Cherry? 10. What is Elachi more commonly known as? Quite a good haul for your birthday! What is an infinity table? Thanks, as always! Your answers are brilliant. I read a lot of foodie mags and read recipe books like other people read fiction, si I am continiously writing questions down.I have more than 20 questions at the moment! The problem is to type them out and to make sure that the answer that I have is correct! The typing things out is the pain! I wish I could just transcribe straight to my computer! Learnt a lot of news things here! Seriously, where does Pink find the time to come up with these brilliant questions every week. It takes a lot of time I am sure! awesome! I battled with this one!